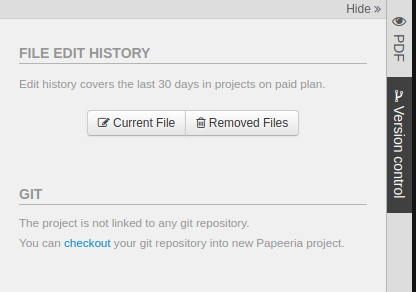 We just have launched a new version control option. File Edit History which is built into Papeeria allows for listing, viewing and reverting to file versions produced hours or days ago. This feature is enabled on all accounts and is available from Version Control pane. In the process of file editing, we save new versions from time to time and saved versions become available in the history dialog. From the dialog, one can preview past versions and replace the live file with the contents of the selected version. This also works for removed files, so you can now quickly recover a file if it was removed by accident. The maximum age of versions in the edit history is limited with 24 hours on the free plan Epsilon and with 30 days on premium plan Delta.